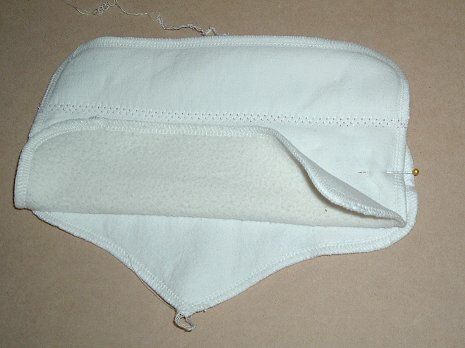 With this style you can choose to have the winged smooth part touching you, so it resembles a normal AIO pad, but with the folded up part against your underpants. 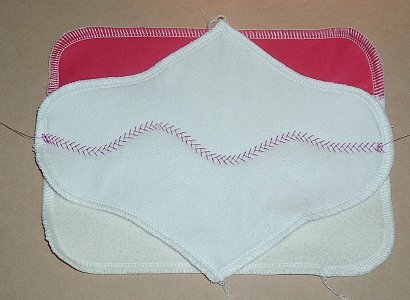 Or you can wear it the other way up, so the winged part is against your underpants and the fold up part against your body. If you are having the foldup part on top, you will need less width to the wingspan, because it’s not snapping around the thicker layers. If you make the kind that has the foldup part underneath, you’ll need less PUL if you want to have it waterproofed. First you take your winged pad shape…. cut 2 of flannel/cotton, or if you want a heavier pad, add more layers…..if doing a waterproofed foldup-on-top one, cut one layer of the waterproofing. Sew or overlock/serge them together. So you basically just have a pad without a core. Then cut out a rectangle that is as long as the pad is, and 3 times wider than you want the crotch width to be when the pad is snapped. Eg if the length of the pad is 11.25″ and the crotch is 2.75″, the rectangle needs to be 11.25″ by 8.25″. For a light absorbency pad cut 2 of flannel (which gives a pad of 8 layers flannel in total), or for something heavier use 1 layer hemp/bamboo with 1 layer flannel/cotton. 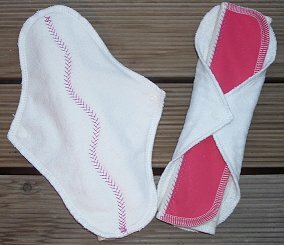 If you want PUL (Pink in this example) on the foldup part, sew that on now. 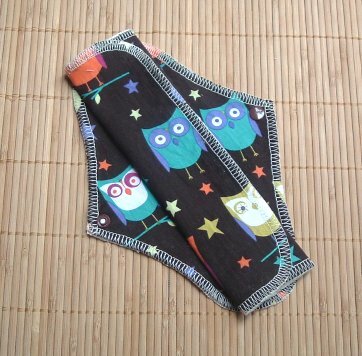 That PUL strip should be the length of the fold up bit but a little less than 1/3 the width (eg in this example you’d want 2.5in wide). Sew that down on the inner edge (if that makes sense – see the photo) – you might want to use a zigzag so the edge stays put and doesn’t curl up. Then sew or overlock/serge around the edges of the foldup part to finish that off. Now you have to sew down the centre to sew the 2 parts together. 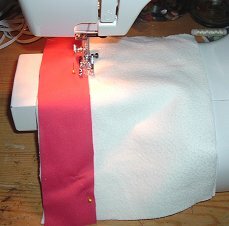 You can do this however you like… you can sew straight down the centre, or a wavy line, 2 parallel lines or a rectangle – it’s up to you. Personally I find a wavy line is good because it’s hard to get an exactly perfect straight line down the dead centre of the pad, and waving the line means you’re sewing more of the pad parts together, but still leaving a little bit of an air gap for faster drying. 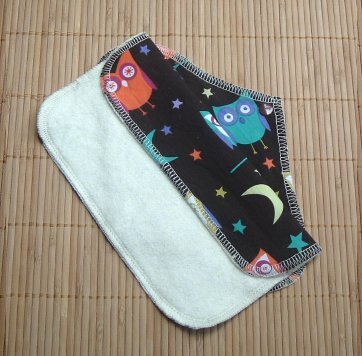 And you finish up with a fold-up pad that has waterproofing in a strip down the back. If you wanted to, you could make it with something fancy like velour in place of the PUL strip, and wear it with the foldup part facing upwards, so you don’t need as much velour as you would in a whole pad. 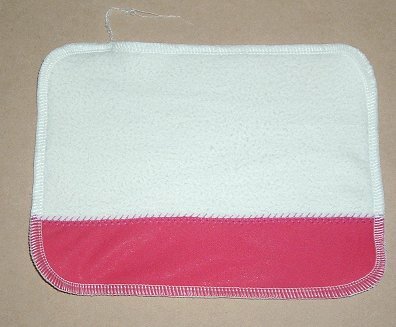 Or you could use some microfleece as water-resistant backing in just that 1/3 section like I have used PUL.